When creating or editing a bot, you may add a webhook by clicking the "+" to add an action as you normally would. From the action selection panel, click on "Trigger a webhook"
Once you've saved your action, the webhook will be triggered once the applicable part of the conversation has been reached. 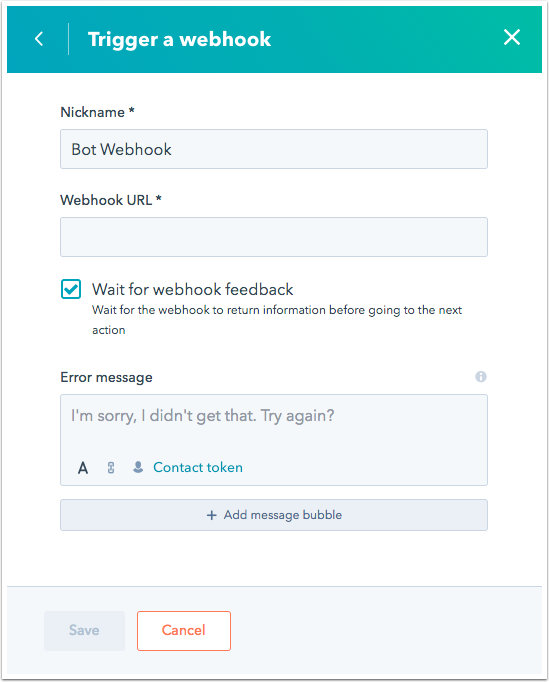 When we trigger a webhook, we pass a payload that contains relevant information to the chat session - including the visitors' responses to any questions asked, their contact ID and information about the bot. For advanced users, you may also optionally include JSON in your webhook's response that will impact the flow of conversation. By doing this, you may impact the flow of conversation or send a custom message based on your webhook's response. // If defined, this will be the next module your bot will go to. If undefined, the default configured behavior will be observed. // If true, the webhook will be triggered again with the visitor's next reply. If false, the default configured behavior will be observed.